OXFORD, Miss. – University of Mississippi doctoral student Sarah Heying has earned a highly competitive fellowship that will send her to Texas A&M University this summer to participate in a unique research opportunity. Heying, a second-year Ph.D. student in English, will have access to the Don Kelly Research Collection of Gay Literature and Culture housed in Texas A&M’s Cushing Memorial Library and Archives. 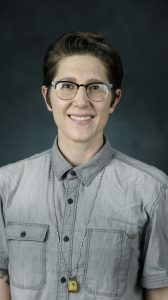 The fellowship will give Heying a chance to advance her research on the ways national and regional periodicals provided outlets for LGBTQ people to stay connected before the internet age. The Liberal Arts/Cushing Library Don Kelly Research Collection Fellowship will fund Heying’s expenses over the duration of her stay. While there, she will take advantage of her access to the renowned collection and write about her findings. Heying said access to the archives will provide material for her dissertation, and the work she produces during the fellowship also will be on display. Heying, originally from Kansas City, Missouri, stood out among other candidates through a rigorous application process. She said the selection helps validate her research aspirations. “It shows me that people want to hear more about what I work so hard to research, which, at this early stage in my degree program, will give me the fuel, confidence and material I need to write my way to a dissertation,” Heying said. Heying earned her master’s degree in creative writing at McNeese State University before enrolling at Ole Miss to pursue her doctorate. She is president of OUTGrads, the university’s LGBTQ+ organization for graduate and professional students.